As a technology pioneer at MIT and as the leader of three successful start-ups, Kevin Ashton experienced firsthand the all-consuming challenge of creating something new. Now, in a tour-de-force narrative twenty years in the making, Ashton leads us on a journey through humanity's greatest creations to uncover the surprising truth behind who creates and how they do it. From the crystallographer's laboratory where the secrets of DNA were first revealed by a long forgotten woman, to the electromagnetic chamber where the stealth bomber was born on a twenty-five-cent bet, to the Ohio bicycle shop where the Wright brothers set out to fly a horse, Ashton showcases the seemingly unremarkable individuals, gradual steps, multiple failures, and countless ordinary and usually uncredited acts that lead to our most astounding breakthroughs. Creators, he shows, apply in particular ways the everyday, ordinary thinking of which we are all capable, taking thousands of small steps and working in an endless loop of problem and solution. He examines why innovators meet resistance and how they overcome it, why most organizations stifle creative people, and how the most creative organizations work. 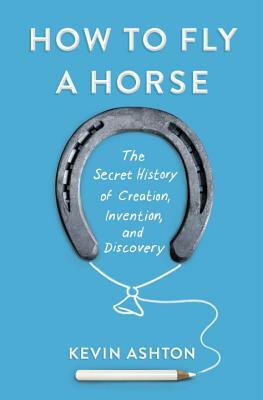 Drawing on examples from art, science, business, and invention, from Mozart to the Muppets, Archimedes to Apple, Kandinsky to a can of Coke, "How to Fly a Horse" is a passionate and immensely rewarding exploration of how new comes to be.